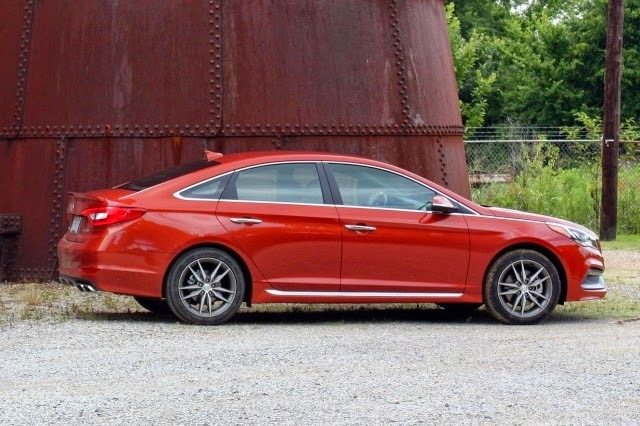 The 2015 Hyundai Sonata is an interesting car. It is a classy, well-built family sedan that reeks of premium aspirations. These excellent qualities show just how far the Korean car industry has come. Yet, the frustratingly unrefined powertrain and lack of performance — even on the sport model — show that Hyundai still has a ways to go when it comes to taking down segment leaders like the Honda Accord and the Mazda6. The Sonata’s strong suit is its design. Hyundai’s family sedan shares many of its styling cues, such as its grille and lighting design, with its up-market stalemate the Genesis. These cues, along with the overall implementation of Hyundai’s Fluidic Sculpture design language give the Sonata remarkable heft given its humble market position. Compared with flamboyant sedans like the Mazda6 or Hyundai’s cousin, the Kia Optima, the Sonata and its slightly anonymous profile are a bit staid. But, by the same token, it has a more grownup vibe than the competition. The same grownup qualities are to be found on the inside. 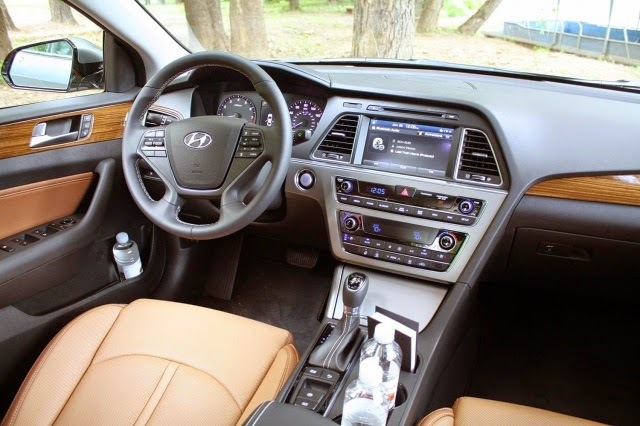 Hyundai’s designers have made extremely clever use of contrasting colors and materials to make the interior’s mainstream cloth and plastic look like they belong in a premium vehicle. Like Hyundai’s other recent efforts, the interior might be a bit space aged for conservative customers. However, it looks good and it feels like someone in the design studio cared. In a segment filled with boring black plastic pits, the only other car that can make a similar claim is the Mazda6. The Sonata also feels like a quality product; after a solid fifteen minutes of poking, prodding, and scratching, I couldn’t find anything loose or poorly installed. Not so long ago, this would have been unthinkable in a Korean car. However, I feel like Hyundai might be in contention for the build quality crown. Another strength in the Sonata’s quiver is tech. When optioned up, like my $27,000 press demonstrator, the Sonata delivers a dazzling array of tech that would look good on a $52,000 BMW. I feel like Hyundai might be in contention for the build quality crown. 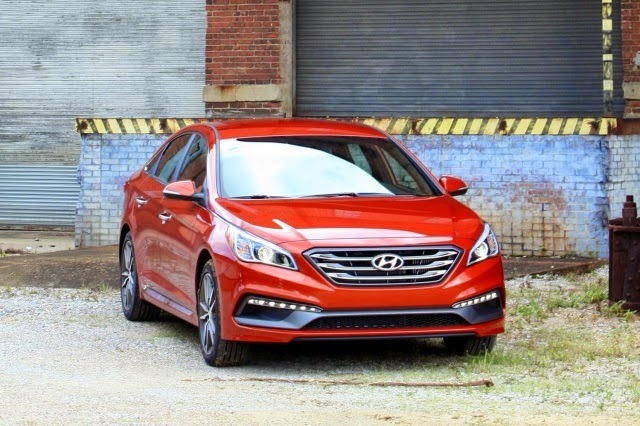 2015 Sonata buyers will not only come away with expected toys like heated seats, keyless go, and navigation, but also some of the latest and greatest the industry has to offer, like streaming internet radio, and Apple CarPlay. Because this is a Hyundai, a shocking number of these features come as standard. Meanwhile Audi and BMW are happy to offer you some gratis windshield wipers and maybe a seat as standard. Access for these features comes through the same touchscreen interface that is found on the new Genesis. It may not be perfect, but it is decidedly above average. What is more, the graphics and operation help augment the premium feel of the rest of the car. To read more about Hyundai’s infotainment check out our review of BlueLink. Unfortunately, performance does not come as standard. By far the biggest disappointment in the Hyundai Sonata is the standard powertrain. A 185-horsepower, 2.4-liter four-cylinder GDI engine mated to a seven-speed dual clutch automatic powers SE and Sport models. The power numbers are right in line with entries from Mazda, Honda, and Toyota, but numbers — not to mention names — are deceiving. Frankly, this engine is bad. The engine is rough and surprisingly loud at low rpm. In fact, when I first fired the Sonata up, it sounded so much like my old Volvo 240, that I thought there was something wrong with it. Fortunately, the noise becomes much less intrusive as speed and rpm increase. Sadly, for a car called the “Sport,” performance is sluggish from a standstill all the way to highway speeds. Compared the feisty Honda Accord, the gutsy Subaru Legacy, and the smooth Mazda 6, the Sonata Sport’s engine is a big disappointment. By far the biggest disappointment in the Hyundai Sonata is the standard powertrain. The engine also spoils what is a remarkably solid chassis and suspension setup. Hyundai’s engineers struck a nice balance between sporty firmness and family-soothing smoothness. The electric power steering is communicative and remarkably direct for a family sedan. The tuning isn’t as aggressive, as some other cars in this segment, but its balance and poise fits with its grown up image. To really enjoy this suspension, customers will need to open up their wallets for one of the two optional engines: the 1.6T or the 2.0T. 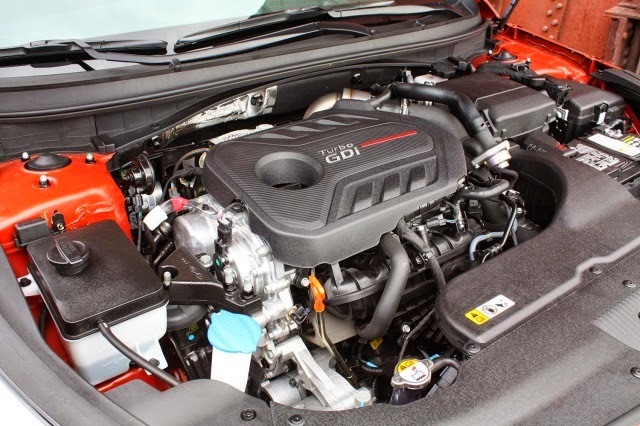 The 1.6-liter turbocharged “Eco” engine delivers a little less horsepower than the 2.4 at 178 ponies, but a better torque curve, which peaks at 195 pound-feet. Then there’s the 2.0T, which boasts 245 hp, thanks to a larger twin-scroll turbo. But this engine starts a $28,575, a full $7,425 more than the base car. For that reason the Eco, which starts at just $100 more than the Sport model is probably the best way to go, especially considering its promise of 28 city and 38 highway mpg. Buyers looking to actively enjoy the driving experience will have to spend a bit more to get one of the upgraded powertrains, which may well disappoint. However, for anyone looking to feel a bit special in a family sedan, the Sonata should be at the top of his or her list. That’s because it is rare to find a family sedan with the same combination of visual charisma, build quality, and options. Yes, it is undoubtedly disappointing that the Sonata — in its base form — is an underwhelming driving experience. But given that this car starts at just $21,150, it is hardly unforgivable.